The parish of Toxteth Park originally formed part of the West Derby Union which came into existence in 1837. However, on 24th June 1857 it became an independent Poor Law Parish. Toxteth Park workhouse site, 1893. The T-shaped main building was around 500 feet in length and three storeys high, with a massive clock tower at its centre. Toxteth Park workhouse from the south-west, c.1925. The girls passed a tolerable examination; I trust that they will make progress in this and other respects under the new teacher. The boys, as on former occasions, acquitted themselves creditably. The numbers are very large for one teacher, and the school room is inadequate in size. I beg to call the attention of the Guardians to a suggestion I made in this book under date the 11th of May 1864, to the effect that a circular swing and some parallel bars should be erected in the boys' yard. The cost would be very trifling, and they would be a great boon to the boys." There is a very good detached infirmary. Lately, however, it has been exclusively used as a cholera hospital, and as a fever hospital. All the ordinary cases of sickness and infirmity have been removed to the main body of the workhouse, and placed in wards which were used by the healthy inmates. This arrangement, which is only temporary, has improperly crowded the workhouse. The sick wards especially are much too full. Very excellent and extensive fever wards have lately been built, and they will soon be fit for use. When these wards are available, the objections to the state of the sick wards will be removed. There are 169 cases of all kinds on the medical list. For the infirmary there is one female nurse, who is assisted by pauper inmates. Two more nurses (one man and one woman) will he appointed to the new fever wards. The ordinary sick in the main body of the house are attended to by a male and female nurse, who also look after the lunatics, of whom there are 12 male and 17 female patients. There is a resident medical officer, and the Guardians provide all the drugs, &c., which are required for the sick at a cost of 120l. a year. All the wards are properly warmed by fires in open grates. Separate places for washing the clothes and linen of fever patients and others should be provided. At present clothes of this description, although not without a previous endeavour to purify them, are sent to be washed in the laundry. Several of the yards require to be either paved or covered with asphalte. In bad weather these yards are in an improper state, and from this cause it is difficult to keep the floors of the day rooms clean. The school rooms for boys, as well as girls, are too small for the present number. The sleeping accommodation, especially of the girls, is confined, and the beds are too near together. The boys are taught-baking, tailoring, and shoemaking, and the girls are employed in household work. The boys and girls are all young and small. They all readily obtain employment as soon as they are strong and old enough to go to service. The swings, bars, &c., recommended by the School Inspector, have been provided, but the rain water stands in pools on the ground where they are placed, and in bad weather they are useless. The workhouse generally is very clean. All the beds and bedding are in a proper suite, and the establishment reflects credit on those who manage it. There was, however, a general complaint of the quality of the bread. It certainly was of an inferior kind, and not such as should be supplied to the inmates. The fever wards referred to were presumably the "Hospital" shown at the south of the workhouse on the 1893 map. By this date, a large pavilion-style hospital had also been erected at the east of the site. By 1905, a further large hospital complex had been erected at the north of the site. Toxteth Park workhouse site, 1905. Mental wards were erected at the south of the site as shown on the 1927 map below. Toxteth Park workhouse site, 1927. 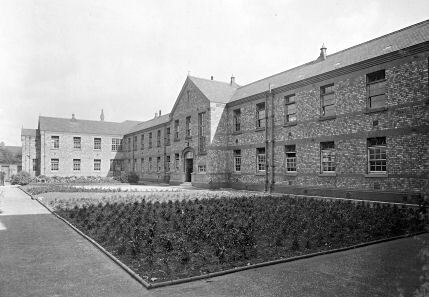 Toxteth Park mental wards from the west, c.1925. 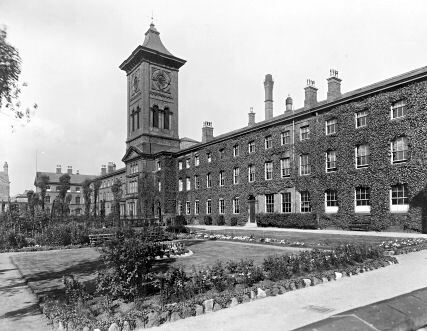 The workhouse later became Smithdown Road Institution and then Sefton General Hospital. In 2001, a major clearance of the site took place to make way for a supermarket. A small hospital block at the south-west of the site was then the only surviving workhouse structure. Toxteth Park hospital block, 2001. 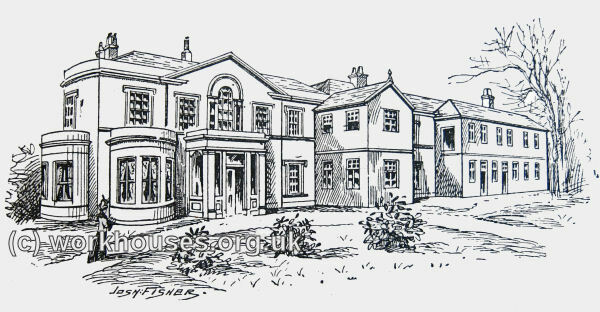 In around 1899, the Toxteth Park Union establised a children's home known as Richmond Lodge on Church Road, Wavertree, dormerley the residence of Sir Thomas Earle. It could accommodate 80 children. A schoolroom was erected for the younger children, while the older ones attended outside schools. Toxteth Park, Richmond Lodge Home, 1899. The home appears to have closed by the 1920s and a bus depot was built on the site. Liverpool Record Office and Local History Service, Central Library, William Brown Street, Liverpool L3 8EW. Relatively few records survive. Holdings include Guardians' minutes (1894-1922); Smithdown Road admission and discharge registers (1860-1869); Creed registers (1882-1954). The 19th Century Poor Law in Liverpool and its Hinterland: Towards the Origins of the Workhouse Infirmary by MW Royden.